Ive even numbered the pieces on the side (inside the seam allowance) so that you get some idea of which piece goes where. The photo of the section all stuck together should give you a bit of a guide. This week has 3 sections. Just look at the nightmare of the larger piece. Once the whole thing is done, you need to write the colour codes or choices onto each small piece. The piece also felt too big and very clumsy when adding new fabric pieces, so I had to use a lot more pins to just secure the sections and make sure that everything was always lying down straight. This is the piece before I joined the sections. 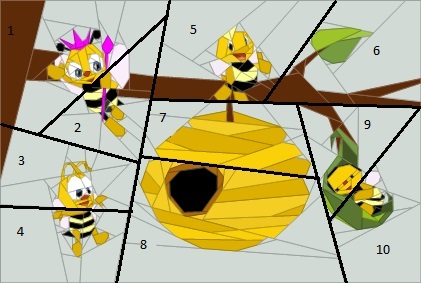 Once that's done, you can join Week 5 little Bee to the rest of the branch as well. And here we have our cute as a button - Week 5 & Week 6 all done and waiting for the rest. ** I want to be finished by the end of March with all of the Honey Bees, so next week I will be sending all of you Week 7 & Week 8 which makes up the Hive. This way we will be able to do the Week 10 piece on March 30th. Wonderful! !